Episode #101 - "Reno to Napa Valley"
Steered by his 19th century Appleton's guidebook, Michael Portillo embarks on a brand new, one thousand-mile American adventure through California. Along the way he discovers how the railroads conquered the wild landscapes of the West and how California became America's richest state. Beginning in the Silver State of Nevada, Michael takes to the skies over the dramatic Sierra Nevada mountain range. At Lake Tahoe, he hears of the first European explorer, known as "The Pathfinder," whose discovery opened up the west for settlement. Episode #102 – "San Francisco"
Armed with his trusty Appleton's Guide, Michael Portillo reaches San Francisco, where he boards one of the city's iconic cable cars. Behind the scenes in the engineering powerhouse, he uncovers the street cars' secret to scaling the city's famously steep hills. At Fisherman's Wharf, Michael samples a local seafood specialty brought to the city by Italian immigrants. Across the bay at Sausalito, he boards a schooner to hear the story of Matthew Turner, the most prolific shipbuilder of his time. In Chinatown, Michael hears about the huge contribution Chinese immigrants made to the Californian economy, both as miners and in building the transcontinental railroad. He discovers an entrepreneurial community which overcame discrimination and finds that fortune favors the brave, when he learns to create an iconic Chinese treat. Episode #103 – "Berkeley to Santa Cruz"
Following his Appleton's guide, Michael Portillo makes a trip to the jewel in the crown of America's National Parks -- Yosemite -- to behold its towering granite cliffs, its giant sequoia trees and cascading waterfalls. He discovers how early conservationists fought to protect the park through laws and encounters a "buffalo soldier" in the heart of the forest. Continuing south through the heart of Silicon Valley Michael visits a high-tech bar, where the waiters are robots. He discovers the origins of modern-day search engines and social media in a California institution founded by a railroad baron. At tech giant, Intel, Michael glimpses the future on a test drive in an autonomous car. A ride aboard the Roaring Camp and Big Trees Railroad takes Michael through groves of mammoth trees – the magnificent California Redwoods. Emerging from the forest on a second vintage railroad, Michael hits the beach and, like a true beach boy, he takes to the waves – on a surfboard. Episode #104 – "Monterey to Los Angeles"
Steered by his late 19th century Appleton's guidebook, Michael Portillo continues through southern California aboard the Coast Starlight rail service. In the historic port of Monterey, Michael raises the Bear Flag of the one-time Republic of California and above it, the Stars and Stripes. He discovers the city's Spanish and Mexican heritage and traces how the former fishing port described as “stinking and decrepit” in John Steinbeck's novel, Cannery Row, has become a beacon for tourists. And discovers how, in place of fish-processing canneries, there now stands a gleaming, state- of-the- art aquarium, where Michael is invited to feed the fish. Arriving in Los Angeles Michael, like many a Hollywood hopeful before him, heads for the Warner Brothers Studio. It was founded on Sunset Boulevard at the time of his Appleton's, with dreams of stardom ahead. His role as a fearless all-action hero is assured as Michael explores the city's latest initiative to break the legendary rush hour gridlock on Los Angeles freeways – a rail link with seven new stations on the LA metro. Episode #105 – "Los Angeles to San Diego"
Michael Portillo strikes oil in the suburbs of Los Angeles, contemplates his navel in the orange groves of Riverside, makes a California Roll and paints a pretty picture in Laguna Beach. It's Mexican Independence Day and the locals are celebrating the country's hard-won independence from Spain in the early 19th century. There's dancing, singing and feasting in the streets and Michael joins the party. He learns that half of the population of LA is Latino -- mainly of Mexican descent -- and hears how after only a few decades, Mexico lost half its territory and California became part of the United States. Episode #106 – "Boston to Concord"
Armed with his nineteenth century Appleton's guidebook to the United States and Canada, Michael Portillo embarks on an 1100 mile railroad journey from Boston, Massachusetts, across the border to Toronto in the Canadian province of Ontario. On the route of one of the earliest railroads in the United States, he reaches Lowell, the birthplace of the American Industrial Revolution. An historic streetcar conveys him to the Boott Cotton Mills, where he discovers a flagrant act of industrial espionage and militancy among the thousands of women and girls who worked there. Michael's guide sets him on the trail of the second largest organ in the world, located now in Haverhill. He is rewarded with a rousing rendition of the Battle Hymn of the Republic, courtesy of the 19th century Handel and Haydn Choir. Episode #107 – "Plymouth to New London"
Guided by his Appleton's and tracing the footsteps of the Pilgrim Fathers, Michael Portillo heads for Plymouth, the "home town" of America. He learns how indigenous tribes of Wamponoag people taught newly arrived settlers to live off the land, inspiring one of the biggest holidays in today's American calendar. Michael boards the Cape Cod Central heritage railroad bound for Hyannis, a favored presidential holiday spot. Catching a ferry to Martha's Vineyard, he discovers that ardent Methodists put the island on the map in the early 19th century by establishing the country's first religious summer camp. Episode #108 – "New Haven to Plattsburgh"
Armed with his Appleton's guide, Michael Portillo continues his rail journey through Connecticut and New England. He takes a crash course in rowing in New Haven, where college teams from Yale and Harvard have battled for victory on the water since 1852. In Vermont, Michael visits a 19th century farm, where the rich milk from prized Jersey cows imported from the British Isles supplied a thriving butter industry. In New Hampshire, Michael ascends the steep slopes of Mount Washington aboard the world's first mountain climbing cog railway, at whose summit an extraordinary weather station has recorded the mountain's extreme weather since 1870. In Burlington, Vermont, a busy timber port at time of his guidebook, Michael ventures into the forest to learn how sustainable and technological innovations have transformed the state's billion-dollar logging industry. In the wilderness of the Adirondack Mountains, Michael discovers the luxurious camps of the rich and famous elite of Appleton's day. In Lake Placid, Michael braves the steep curves and speeds of an Olympic bobsleigh run. Last stop is an American fort mistakenly built in Canada! Episode #109 – "Montreal to Ottawa"
Following a special 1899 Canadian edition of his Appleton's guide, Michael Portillo leaves the United States to embark on the next leg of his rail journey in Canada. In the vibrant metropolis of Montreal, he discovers how French and British colonial roots have influenced the city's construction, cuisine and culture. Undaunted by his guidebook's description of the treacherous Lachine Rapids, Michael gets a thorough soaking on a white-knuckle boat ride down the St. Lawrence River. Heading west into Ontario he reaches Alexandria, where a tartan army escorts him to the 70th annual Canadian Highland Games. His Scottish roots entitle him to put on a kilt and he attempts to toss the caber! In the Canadian capital, Ottawa, Michael visits the country's Parliament to hear about the birth of the new nation after Confederation in 1867. And, at Ottawa's historic Central Experimental Farm, Michael hears of the pioneering discoveries, which launched a Canadian wheat boom. Episode #110 – "Thousand Islands to Toronto"
Steered by his 1899 Appleton's guide, Michael Portillo's rail journey through eastern Canada continues along the Grand Trunk railway, following the route of the St. Lawrence River. At Brockville, he leaves the tracks for a nautical pilgrimage through the beautiful Thousand Islands. In the port city of Kingston, Ontario, Michael visits Fort Henry and, dressed for the occasion, is entrusted to fire the naval guns that protected the nation's southern border during the 19th century. Travelling west to Port Hope, he learns of the antics of a celebrated 19th century high-wire walker known as "The Great Farini." And, in a spirit of showmanship, Michael tests his balance with the modern sport of slacklining. At Toronto's Union Station, Michael is invited to inspect an ambitious underground engineering project designed to expand capacity for the city's modern commuter boom. Michael's Canadian adventure concludes in Toronto's High Park, where he seeks the origins of patriotic song, The Maple Leaf Forever. 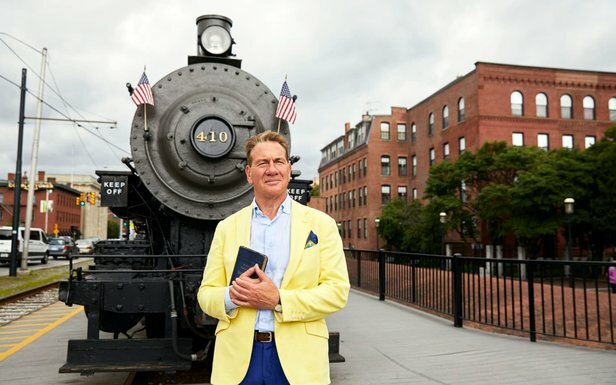 Michael Portillo explores America by rail following Appleton's General Guide to the US of 1879 which is published at a key moment in American history - the turning point from `new world' to the richest nation ever known.